If you feel a little uncomfortable when you approach a doctor, nurse, therapist or other healthcare professional because you don’t want to be perceived as just another sales rep, then why not approach them in a way where you will feel more comfortable and you will be more welcome. What am I talking about? 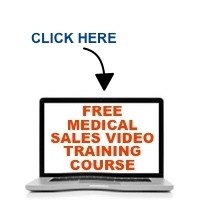 It’s all here in this edition of the Medical Sales Guru Podcast. If you’ve been providing your healthcare customers with great service and it’s not bringing you the business you expect, here’s what you need to do–STOP!….that is, if they won’t reciprocate with more opportunities for you to grow your business. Service is critically important, but you’re in the SALES business, not the SERVICE business. Maybe you just need to change your thinking and then change your approach so that you can go beyond just being a “friend” to your customer. Start the year right by adopting a new attitude that will move your business in an upward directions. Have you ever had a customer say something about you or your product that isn’t true? Maybe it’s even slanderous or bordering on slander. Or perhaps the customer informs you that if you don’t lower your pricing, you’re going to lose the business. You’re used to dealing with difficult situations and you’re ready to charge in and address the issue head-on. Stop! Confronting customers on delicate situations is a high-wire act–one wrong move and you’re on the ground with that customer, maybe forever. There is an effective way to confront customers on situations where they may not be pleased with the message. It worked very well for me throughout my medical sales career and I advise you to stop and consider it before you erase any opportunities to ever do business with valued customers again. Have you ever walked into a customer and demand that they buy your product because it’s on a GPO or IDN contract? If you have tried to do this with a physician, the response you received may have left a visible mark! In this episode of the Medical Sales Guru podcast, we discuss an approach to avoid angering your physician customers when your sales efforts are supported with a buying contract.